All 8th graders are encouraged to consider a Catholic high school. Learning about the rich and diverse offerings amongst Catholic high schools through this site and by visiting the schools themselves should be a part of every student’s high school research. There are over 30 high schools in the city and suburbs, each with its own special traditions and offerings. All of these schools promote values-based environments and academic excellence. 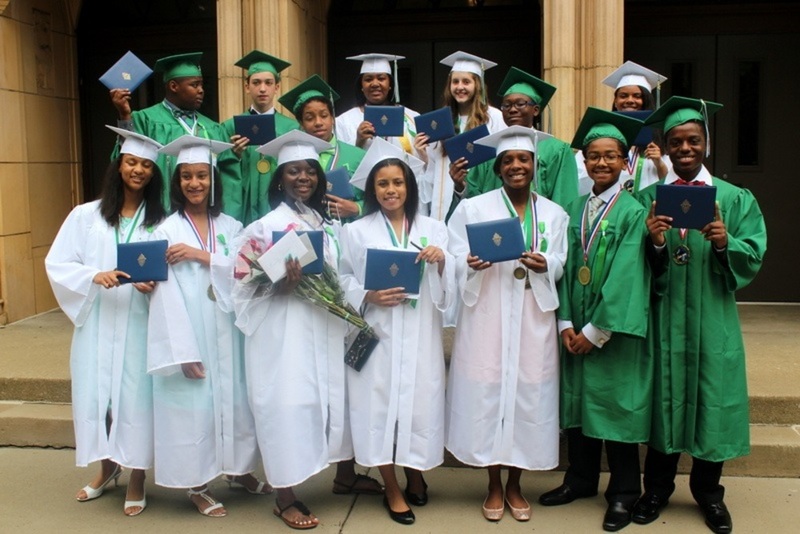 Chicago Catholic high school students perform above all local and national averages, graduating at a rate of more than 98 percent, with 96 percent of graduates going on to college. Students participate and succeed in extracurricular programs at high levels, perform hundreds of hours of community service, and earn millions of dollars in college scholarships each year. Please read more about the application and admissions process below in order to discover why and how you can become a part of a strong Catholic high school. As with any important decision to make, there are things you will want to remember when applying to Catholic high school. Here is a list of important dates to note and use as you are making your plans to attend high school. How can I learn more about my Catholic school options? Learning what a school offers and what the environment is like is very important. We highly recommended that all 8th graders interested in attending high school go to open houses and participate in shadow days to get a true sense of that school. Talking with admissions officers, school administrators and teachers, plus current students and families is a helpful way to get to know each school and see whether it is a good match for you. We also offer school profiles and a match tool on this website to help you discover which Catholic high schools have programs and offerings that are a match for you. What are high school open houses? High school open houses are events where school staff and students showcase the school’s programs, curriculum, clubs, and sports. It is an opportunity for you to speak with members of the school community and gather information on what the school has to offer. Open houses are open to all students and parents or guardians. What are high school shadow days? A high school shadow day is an opportunity for a potential student, like yourself, to spend the day at a high school and attend classes as well as participate in school functions alongside a current high schooler. Most high schools have specific shadow days assigned on the their school calendar throughout the school year. We encourage you to contact schools directly to attend a shadow day. Fall shadow days are generally reserved for 8th graders while spring shadow days are reserved for 7th graders, and sometimes 6th graders. How do I apply to a Catholic high school? All 8th grade students, with few exceptions, apply to a Catholic high school by taking the high school entrance exam in December. Students should take the exam at the Catholic high school they wish to attend. You may only take the high school entrance exam one time. After taking the high school entrance exam, you will be asked to submit additional information to the high school where you took the exam to complete your application process. This information may include your report cards. The exceptions noted above are for those students who wish to attend a high school in the Cristo Rey network (Cristo Rey, Cristo Rey St. Martin, Christ the King). These high schools do not require you to take an entrance exam. You may apply to these schools directly through the admissions office of the Cristo Rey high school you wish to apply to. You may apply to only one Catholic high school at a time. For example, say you apply to school A by taking the high school entrance exam at School A. If you later want to apply to School B, you must request that your exam scores be sent from School A to School B. This means that you are now applying to School B and you are no longer applying to School A. What is the high school entrance exam? The high school entrance exam is a test offered to 8th graders who desire to attend a Catholic high school. The exam is given on the first Saturday in December of each year at all Catholic high schools, except Cristo Rey network schools. The High School Placement Test (HSPT) is the most common Catholic high school entrance exam. Each school controls their own test and test environment. Do I register for the high school entrance exam? Registering for the test in advance is not mandatory but it is encouraged. Contact the Catholic high school you wish to attend for their registration process. If you do not register for the entrance exam in advance, you will be treated as a ‘walk-in’ on the morning of the test. Parents or guardians of ‘walk-ins’ will need to provide the school with their emergency contact information that morning. You will need to bring $25, payable by cash or check, to pay the examination fee at the school administering the exam. What else do I need to know about the high school entrance exam? Students may take the entrance exam only once as it serves as your application to attend Catholic high school. It is best to take the entrance exam at your top choice high school because the school where you take the entrance exam is where your scores for admission are sent. You may later have these scores sent from one high school to another at your request, but you may apply to only one Catholic high school at a time. You will need to bring several #2 pencils to the exam. After I take the entrance exam, what happens next? On the day of the test, the high school should provide you with information about completing the admissions process and if necessary, financial aid information. This information will contain deadlines for all important paperwork that schools need to receive. Before the beginning of February, you will receive communication from the high school letting you know if you have been accepted, waitlisted or declined. You will then need to decide whether to accept the spot at that high school or to have your test scores transferred to another high school. Is every student that takes the entrance exam at a Catholic high school accepted at that school? Because of school size, academic offerings, and other factors, every child may not always be accepted. It is important to research the different options during your selection process and have a sense of your prospective schools' acceptance rates. Consider meeting with a teacher or a school administrator at the school you are currently enrolled in for support in the application process and to learn about high school acceptance rates. If you are placed on a waitlist, you should decide whether you wish to remain on the list and stay in consideration for potential openings at that school, or ask that the school send your test scores to another Catholic high school so that you can apply to that other school. Students do not take another entrance exam at the second school. If you are declined, then you should request that the entrance exam test score be sent to another Catholic high school. This new Catholic high school will then make their own independent decision regarding your acceptance. Do Catholic high schools offer scholarships and/or financial aid? Yes! Catholic high schools are committed to making Catholic education as financially affordable as possible. Each Catholic high school has its own process for applying for financial aid. In general, you and your family fill out an application, submit it to the school and wait for the school to respond with a tuition amount. In addition to need-based financial aid, schools also offer merit-based aid. Students that take the entrance exam at a school are eligible for that school’s merit-based scholarships. How do Big Shoulders Fund scholarships work in high school? If you currently receive a renewable BSF schoalrship in elementary school, you may be eligible to bring that BSF scholarship with you to almost any local Catholic high school. To find out if your elementary school BSF scholarship is carries over into high school, please contact Big Shoulders Fund directly. It is also possible to apply for and receive a BSF scholarship in high school if you are accepted to attend a BSF-supported Catholic high school and that school applies for a scholarship on your behalf. The Big Shoulders Fund-supported high schools include: St. Francis de Sales, Leo, Our Lady of Tepeyac, Mount Carmel, St. Rita, De la Salle, Cristo Rey, Holy Trinity, Christ the King, Josephinum, and DePaul. I am not sure where I want to go to high school. Should I still take the entrance exam at a Catholic high school? Absolutely. Even if a Catholic high school is not your overall first choice, it is wise to take the entrance exam in December at one that would be a good fit and match for you. By taking the entrance exam at a Catholic high school, you would then have a strong and safe option for high school. You would also make yourself eligible for that high school’s merit-based scholarships and financial aid. Do I need to be Catholic in order to attend a Catholic high school? No, there is no religious rule or requirement that students must be Catholic to attend a Catholic high school. What other options are there for high school besides Catholic high schools? In Chicago, other high school options include public neighborhood high schools, magnet and selective enrollment high schools, military schools, charter schools and other independent private high schools. Each school or set of schools has its own admission process. It is important to research these other options to learn the particular advantages and disadvantages of each, learn if one is a good fit for you, and be aware of important deadlines as well as application steps.